My name is Shirley Elwell and at Slender Thread Workshop I weave rugs from hand-spun yarn, using wool from a variety of British rare breeds. From raw fleece (usually organic) to finished product the entire project is individually handcrafted to the highest standard. I have been spinning and weaving my Slender Thread Workshop rugs since 2001, the year I arrived in this quiet and beautiful valley in Bleddfa, Mid Wales. By preserving the simplicity of traditional skills and using locally produced natural materials I try to build a bridge between the modern desire for high quality hand crafted products and the everyday lives of people living in ancient times, whilst promoting an environmentally sustainable approach to living. In the beginning is a sheep on a hillside. I work to an age-old pattern of collecting the wool from a local source, washing, carding, spinning and weaving, to make the quietly beautiful rugs that mean Slender Thread Workshop. 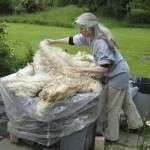 The natural variations in tone of each fleece are preserved in the way the yarn is constructed and then transferred directly into the rug by weaving using a simple tapestry technique (which also means that the rugs are fully reversible). The random nature of the material and this method of construction makes each finished item unique. See the Design page for more information about the creation of the Slender Thread Workshop rugs. 5 Cwm-y-gerwyn, Bleddfa, nr Knighton, Powys, LD7 1PB, UK. This website and all its contents is copyright © 2016, the site owner Shirley Elwell and individual contributors. All rights reserved. No material, including but not restricted to images and text, may be used in any form without the express written permission of the site owner and individual contributors. All photographic and textual material on this website is owned by and copyright the site owner and individual contributors. To re-use any material please contact the site owner. Copyright © 2019 Slender Thread Workshop. Powered by WordPress. Theme: Spacious by ThemeGrill.